When we embarked on this "Grace-filled journey" last November, it wasn't exactly the journey we hoped to take. But our friends, family and community (both near and far) have been there to join us every step of the way. Although there aren't many ways we can help Grace, we can raise money to help with research for INAD (infantile neuroaxonal dystrophy). And this community has certainly been generous. We have attended so many fundraisers these past few months, and know that this money will be put to good use at Washington University. We continue to make plans for "A Grace-Filled Journey" 5K and one-mile race, which will be held on Sept. 5, and hope you will join us as we continue to raise awareness for this terrible disease. It seems like everywhere I go, someone new tells me they can't wait for the race in September. We will have people from all over the country participate here in Hillsboro and in their own home towns by virtual race. And it's sure to be a really great day. A few weeks ago, I got a phone call from a friend of mine, Angie Tefteller of Hillsboro. I met Angie several years ago when I was doing a story for Litchfield McDonald's. They were kicking off their annual "Give a Little Love" campaign, and Travis and Angie's son, Dalton, were being featured, as the family had stayed at a Ronald McDonald House. Grace and Dalton celebrating "superhero" style at Dalton's 16th birthday party. In some ways, Dalton's story is similar to Grace's. 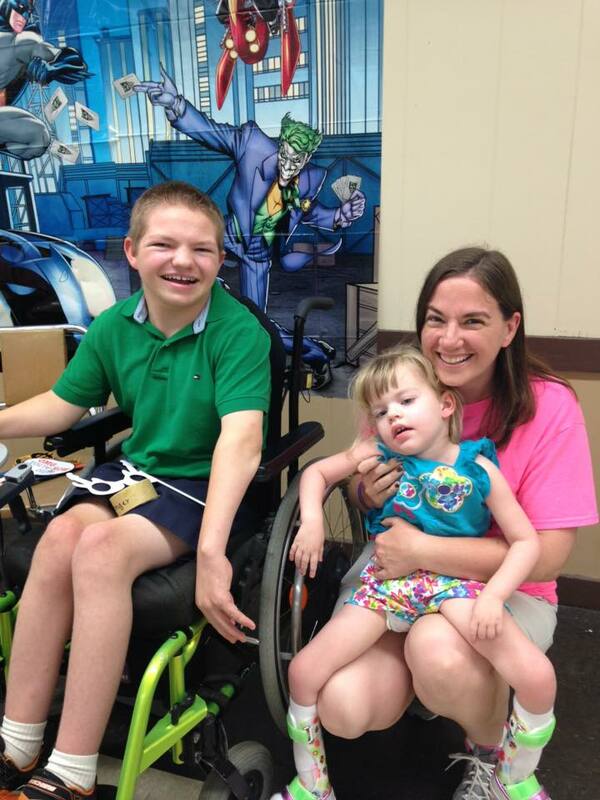 He was born "normal," but began to regress in his walking skills after he turned a year old. The family is still seeking a diagnosis for his condition, but Dalton definitely doesn't let any of his challenges or limitations slow him down. He's a Special Olympics athlete and medalist, and a multi-year winner of the smile contest at the Illinois State Fair. Angie called to tell me she had an idea for a fundraiser for the INAD study, and also that she had been following some of the posts we have shared from Ainsley's Angels of America. And she wanted to get a push chair for Dalton so she could run in the 5K event for Grace. For those who don't know, Ainsley's Angels of America, also has a connection to INAD. Ainsley Rossiter, the 11-year-old daughter of Kim "Rooster" and Lori Rossiter, has also been diagnosed with INAD. I first learned about Ainsley's Angels of America before we knew Grace had INAD. Last year, my brother, Johnny, pledged to run 1,000 miles for Grace, and during his first marathon, he saw someone pushing a chair with the Ainsley's Angels logo on it. It was striking enough that he went home to look up what it was all about, and we were both inspired by the story. 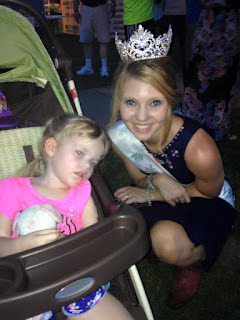 The mission of Ainsley's Angels of America is to ensure everyone can experience endurance events, while also building awareness about America's special needs community through inclusion in all aspects of life, by promoting awareness, providing education, and participating as active members in local communities. They have chapters all over the country and help support a wide variety of races. According to their website, when Ainsley went for her first jog during a local road race in 2007, she gave a radiant wind-induced smile that anyone would envy. 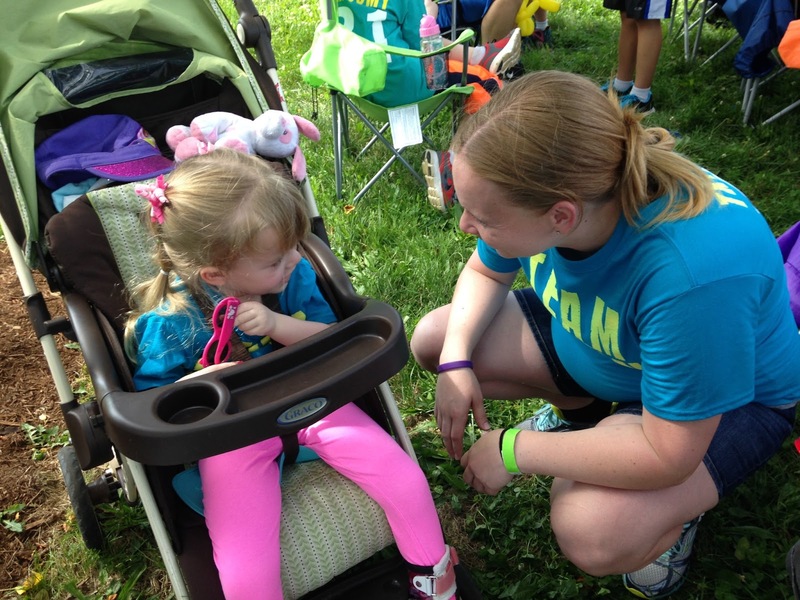 In an instant, running provided the family with a therapeutic means to fight the devastation associated with learning and trying to live with the fact that sweet Ainsley has a terminal illness. Her smile on the race course, the positive energy surrounding the start line, the other rider athletes and pushers smiling from ear to ear, the togetherness of every member preparing to ‘roll with the wind’, the fearlessness of the athletes, the normalcy of the family, and the love everyone shares is a therapy like no other!" To date, Ainsley has been the captain of more than 80 races, including five half-marathons, and continues to provide inspiration for runners everywhere. 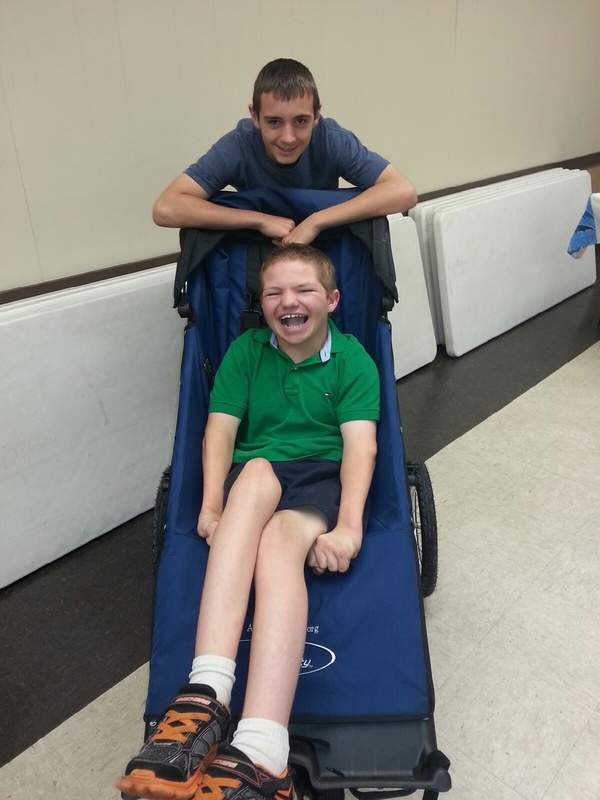 Dalton and his friend, Mitchell Beck are ready to roll in the Grace 5K this fall. When Angie called me, she told me that she had been in contact with Ainsley's Angels of America about the possibility of purchasing a used push chair. She received a response that the group didn't really have any used chairs, but they would be glad to help her set up a fundraising site, so others could help with the expense of a chair for Dalton. She thanked them for their response, but said she would continue her search in other ways, and that she wanted all the fundraising efforts to go to INAD research. Not long after, she received a message from Rooster Rossiter, asking for her address. She provided it to him and once again asked about used push chairs with no luck. When she called me, it was to tell me that she returned home from work one day to find a rather large box at their house, and that the Rossiters had made sure Dalton would be able to be a captain in the 5K for Grace this fall. Angie and I both got a little teary-eyed on the phone, just so grateful for the kindness of family, friends and even strangers. The Teftellers have already started training for "A Grace-Filled Journey" 5K, and we hope you will too. I promise it's a day you won't forget. For more information or to sign-up for the race, visit www.facebook.com/GraceFilled5k or stop by The Journal-News office in Hillsboro or Litchfield to pick up a registration form. All proceeds will benefit the INAD study at Washington University. I'd like to think that now I know how farmers feel. All of last week I had one eye on the weather forecast and the other on the clouds as I waited to see if Mother Nature was going to wash away the inaugural Grace Cup on Saturday, June 20. 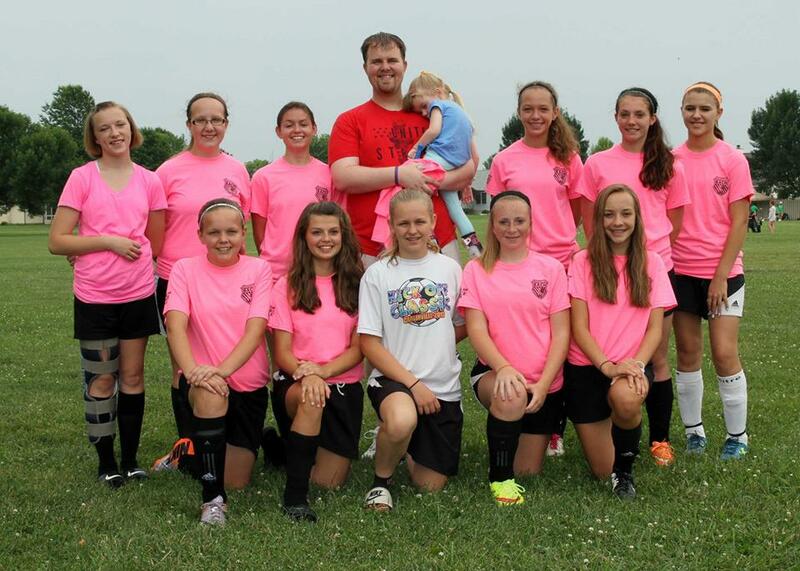 Team members and coaches from the inaugural Grace Cup. I'm used to issues with foul weather, having had it determine my schedule as The Journal-News sports editor for the last eight years, but never have I been on this side of the rainout dilemma, as the actual organizer of an event. The rain situation was one of several issues that had me borderline neurotic leading up to the game. (my beautiful and ever supportive wife Mary might remove the adjective "borderline"). Recent Hillsboro High School graduates Bradley Hill and Alexis Hefley volunteered their time to help us out! Alexis manned the table, and Bradley sang the National Anthem. I was still adding players to the rosters the week before the game, trying to get up to 15 on each team, a plateau that I would not reach. My biggest challenge in this was not the willingness of players to play, but the fact that I was trying to get players to commit to the game when they had other things on their mind, namely their high school graduation. Had I thought of the game in August instead of April, things might have gone more smoothly, although as my good friend Travis Matthews, coach of the Area All-Stars, reminded me, I am dealing with 17 and 18 year old kids here. Hanging out with Uncle Daniel, and Grandma and Grandpa during the game. I also fretted about concessions, referees and programs in the week leading up to the game. By some act of God, all of it seemed to come together in the end. The RHSA, the Herman family and Donna and Jerry Wagahoff of West End in Raymond generously donated time, food and all the proceeds ($200) from the concession stand to put my fears to rest. Another friend, Tim Gould of Carlinville, not only agreed to be one of the referees for the game, but he also secured another official, Tony Baines of Virden, for the other side of the field. I can't thank both of them enough for taking time to come over to Raymond to help make the game a success. The programs also turned out fantastic, after some minor issues figuring out how to get them printed correctly, due in large part to the help of my father-in-law. There's always time to play with puppies! Ultimately even the two biggest worries of the day turned out to be minor blips on the radar. The field was a little damp from a week's worth of rain, but Saturday was nothing but sunshine when we kicked off at 5 p.m. The player situation was touch and go for a while, especially after two players backed out that morning and a third didn't show up, but all worked out well in the end. Aunt Anne came to visit and get a "vuvuzela!" We shuffled two players from Staunton, Adam Mongold and Conner Wiles, to the Area All-Stars, giving them an extra shirt as a bonus. Mongold quickly became one of my favorite characters of the day, as he said the Grace Cup jerseys were now "the two nicest shirts I own." I had a mild panic attack when the SCC scored 36 seconds into the game on a goal by Litchfield's Kelson Triplett, then again a minute later on a goal by Nick Copley of Pana, but Travis assured me that play would even out and everything was alright. Grace also loved visiting with the spectators! He was more or less right. The Area, who would have benefited from the three players who were unable to be at the game, trailed 9-2 going into halftime but probably had close to the same number of shots on goal as the SCC. On the bright side, everyone seemed to be having fun, with the possible exception of Tyler Roth, Taylorville's all-sectional keeper who was took the brunt of the nine goals. At halftime I told Roth he did a great job and I meant it. He had a couple fantastic saves, as did fellow keepers Alex Hamerlinck and Arlen Magelitz, that would have made the any Sports Center highlight reel. There were actually quite a few special moments on the field. Carlinville's Pietro Lentini and Lutheran's Adam Forestier both put on a clinic as they scored five goals each to lead their respective teams. They play different styles, but share the same ability to dominate on the field and were two of the best players I've seen in the area over the last eight years. Kyle and Grace got interviewed by WSMI's Sarah Thomack after the game. Copley would have four goals and was a force up top for the SCC. All that running took a toll on the Pana grad though, who seemed relieved when we shortened the game to 30 minutes in the second half due to the heat and lack of subs. This drew some chiding from SCC coach Jason Burke, who seemed to be having as much fun as the kids on the field. Greenville's Will Schaufelberger would also score twice, including a stellar mid-air volley off a cross that may have been the goal of the game, while Mongold scored for the Area, who lost 12-6, but "won the second half" according to Coach Matthews. Ultimately the game was just part of what made Saturday a success. 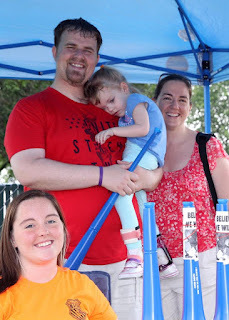 All told, we raised $1,100 for the infantile neuroaxonal dystrophy research study at Washington University in honor of my daughter Grace, who is battling INAD and is the tournament's namesake. Taking her out on the field for the ceremonial first kick was one of my two favorite moments from the game. The other was when I brought her out to the players after the game for the team photo. Grace made the first official kick of the game! I wanted them to see what we were raising money for. I wanted them to see what this stupid disease has taken away from my princess. But most of all, I wanted to thank them for playing in the game, because with out the players, the Grace Cup wouldn't be a reality. And this won't be the last Grace Cup either. Throughout the game I talked with Travis, Jason and Terry Todt, who generously donated his services that day as well, about what we can do to make the game better. Ultimately, I don't care if the game ever gets any bigger. 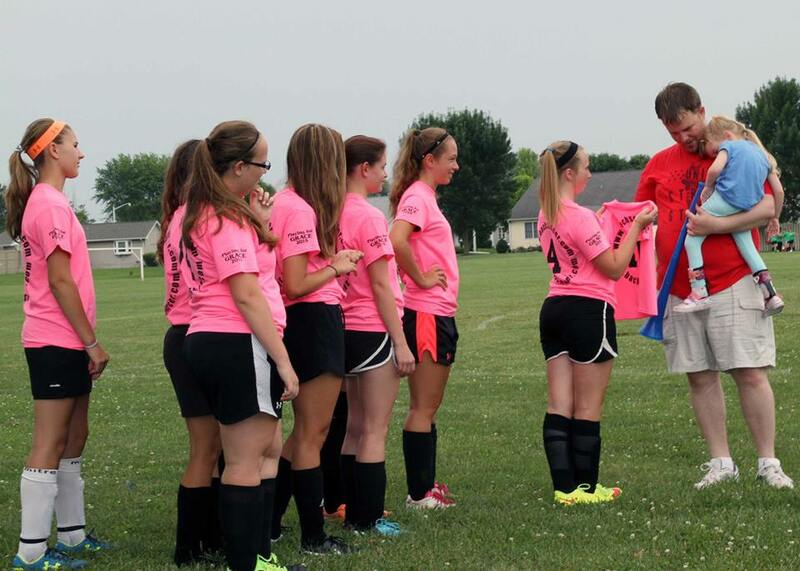 I was thrilled with the amount we raised and the awareness we gained for soccer in this area and for INAD. I imagine I'll do it for as long as I can, or for as long as players are still interested in playing. Ideally, I'll be doing it 15 years from now, watching Grace run around the field after graduating from Hillsboro High School, INAD nothing but a distant memory. I'm not sure if that will ever happen or not, but then again, I wasn't sure we'd be playing soccer last Saturday either. Sometimes it feels awesome to be wrong. It seems like I write a lot of blogs about how kind that people have been to us, and I could just write over and over and over again how amazing people in our community have been to us. And when I write community, I mean that in the biggest sense of the word, because it stretches far beyond the confines of our town and our county, and even our state. Last Wednesday, I came home to pick Grace up and feed her dinner, and I noticed someone in our backyard. One of our neighbors was mowing our yard. And it was the best present ever. It had been a busy weekend and week for us, and we just hadn't had a chance to get around to mowing the yard. It wasn't terrible yet, but I knew we had several engagements this coming weekend, so it was just going to have to wait. Kyle said he wondered if we would get an ordinance violation from the city. But one of our kind neighbors made sure that didn't happen. I stopped back to thank him, and he told me he was trying to finish before we got home from work. He told me that he thinks about us every day, and this was just one way he could help to give us a couple of hours together as family. It was a truly special gift, and we definitely enjoyed the time together. Other friends and family members have brought meals to us at different times. We just feel truly blessed to be surrounded by love, seemingly all the time. Since the beginning of the year, I would say Kyle and I have gotten a phone call or an e-mail just about every week from someone who wanted to do a fundraiser for Grace or the INAD study. We have been able to raise a great deal of money for the study, and the staff at Washington University want to make sure we share their thanks with all of our community. Each and everyone of you is making a HUGE difference in the lives of INAD children through your kindness and generosity. Last week, we got a letter from Zion Lutheran School with a donation to the study of their fourth quarter offerings. Since they made the check out to Washington University, we went ahead and sent it on. I got a note back saying how touched they were by the letter and the fundraiser by the students. Then, I got an e-mail from reigning 2014 Miss Irish Days Queen Ailie Elmore of Farmersville. She and this year's queen candidates were hosting a 50/50 raffle as part of this year's pageant, and they were giving the proceeds to the INAD study. She asked if we would be there that night, and we said we wouldn't miss it. Chances are we would have been there anyways to cover it for the paper, but we made a point to make sure that was our assignment. 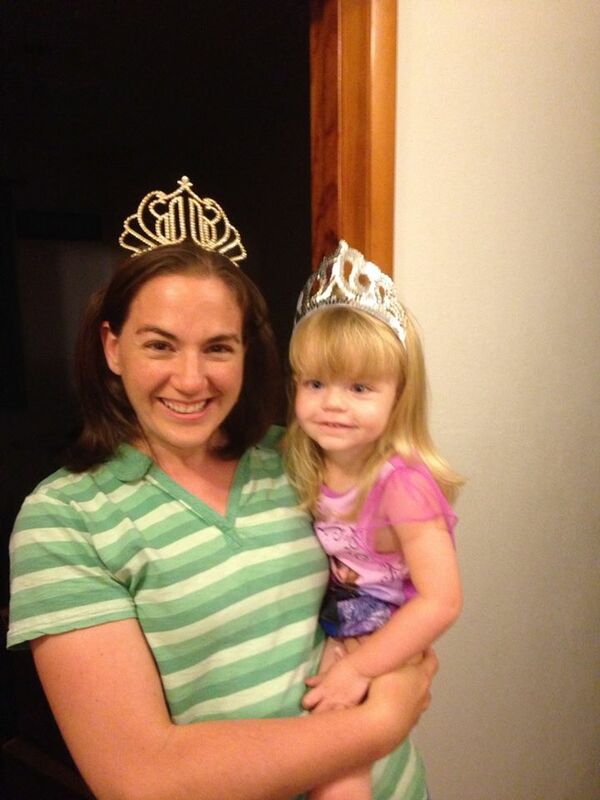 Grace wore her sparkly princess shirt, and we made it a point to see Ailie after she gave up her crown. Grace gave her a thank you smile, and we had a chance to tell her how grateful we were. She smiled back at us, and said when she had to decide where to give the money, that it wasn't even a question. She couldn't imagine picking anything else. How cool is that?! Then tonight, we got a very special visitor at the paper. I've known the Kipers forever, and their grandpa writes for the paper, so they've always been special to us. I started babysitting for Kaylyn when she was six months old, and she's now in college. Those of you who like math, will probably realize that makes me old . . .
Well, Kaylyn brought her younger sister, Kamryn up to the paper tonight because Kamryn had something she wanted to give us. She handed me an envelope that she had carefully written Grace's name on. 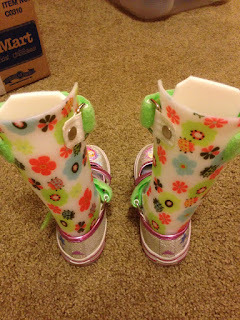 Inside was a cash donation for Grace that Kamryn earned selling bracelets she made. She told us that a couple of friends helped her out, and that they sold the woven rubber band bracelets at the sports complex. It truly made my night. And it goes to show you that kindness comes in all shapes and sizes. We have been so touched by all the acts of kindness and generosity shown to us these last few months. I'm a bit behind on all the thank you notes, but please know that each and every one of you make a HUGE difference in our lives. You remind us that the world is full of kind people, just waiting to show you how much they care. As you go out into the world this week, strive to be kind to each and every person you encounter. You never know how much it will mean to them, and it will make the world a better place to live. Stepping up for a good cause. Yup, it's that simple. As we get ready for Grace's 5K event in Hillsboro later this fall, Grace had a chance to participate in a couple of walking events this past weekend. And it makes us all the more excited to share in "A Grace Filled 5K." Up first was a 5K event in Hillsboro in memory of Hillsboro High School student Balin Robbins. Kyle and I couldn't go because we were out town the night before, but Grace spent the night with mom and dad, so she walked with them. Our little superhero with her grandma and grandpa. One of the neat things to see about some of the 5K events is the theme. Some of them are glow-in-the-dark, others spray you with bright colors and some even have you run through the mud. This one had a superhero theme, since superheroes were some of Balin's favorite characters. Throughout the race, people were dressed in costumes or t-shirts of their favorite superhero characters. We picked out a special T-shirt for Grace. Although it has a Superman shield on the front, the letter F replaces the letter S. F for Faith. We picked out Grace's "Fight with Faith" shirt because Faith is one of the biggest superheroes we know. 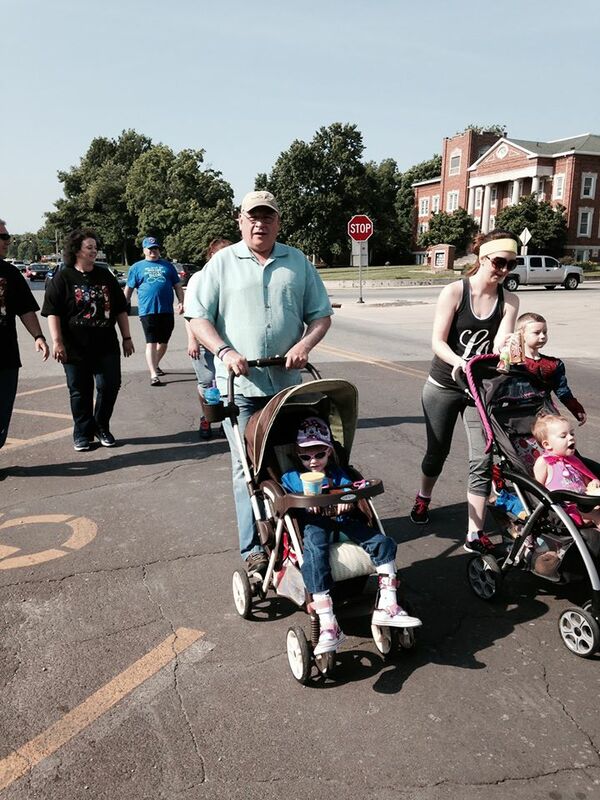 I'm not sure who had more fun at the walk, Grace or her grandpa. 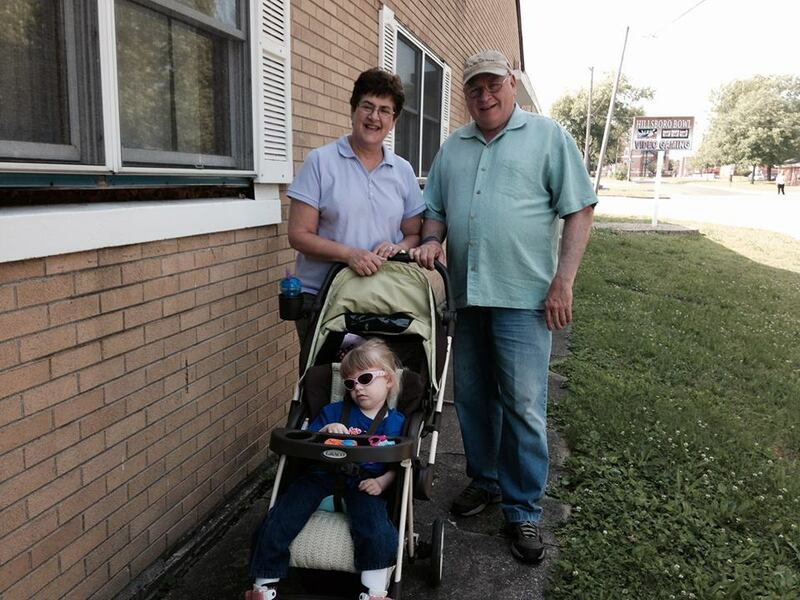 I'm not sure who had more fun on that walk, Grace or her grandma and grandpa. They loved being able to do it together, and helping such a great cause in the process. The organizers were able to raise more than enough money for a memorial bench outside the high school and to start a scholarship in Balin's name. Those are some pretty awesome superheroes. Several weeks ago, Kyle's sister, Mikaela asked if we would be interested in walking with she and Scott in the Step Up For Down Syndrome walk in St. Louis on Sunday, June 7. One of her friends, a physical therapist in the area, put together a team in honor of her son, Logan, who has Down Syndrome. This same physical therapist just so happens to have been Grace's very first physical therapist when we started Early Intervention, someone we are lucky to call a friend. 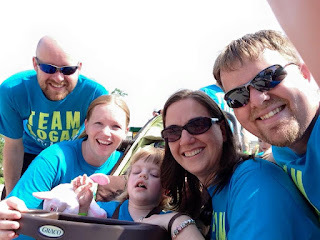 We were thrilled at the idea of coming down to help with such a great cause for Jen and her family, and Mikaela took care of registering us and ordering our Team Logan shirts. We were SO honored to be part of Team Logan and cheer him onto the finish line. The walk takes place in Forest Park in St. Louis on the grounds of The Muny, which is one of our very favorite places. They had all sorts of activities set up for kids and families from inflatable slides and bounce houses to face painters and balloon vans. Everything was very family-friendly, and just a fun experience to be a part of. When it was time to take off for the walk, nearly 50 members of Team Logan gathered with hundreds of other walkers, many with brightly colored shirts in honor of other participants. There were SO many awesome kids there taking part in the walk. One of Grace's favorite parts of the walk was hanging with Aunt Mikaela. As we headed off for the one-mile walk, Logan's dad set down his reverse walker (similar to one Grace used to have), and he took off toward the starting line, amid claps and cheers, and he would just grin. Although he did part of the walk in his stroller, Logan took up his walker again just in time to cross the finish line and get his very own medal. It was the most inspirational part of the day watching Logan smile as he crossed that finish line, such a special moment to see. His mom has been there to share in so many of our special moments with Grace, and they will always be a special part of our family. We hope you will consider joining us for another very special moment this fall as we celebrate "A Grace Filled 5K" and raise money for the INAD research study at Washington University. It's a guarantee that everyone who steps up to help will be a true superhero in our book. Click the link for online registration for "A Grace Filed 5K." I am and forever will be your 1996 Old Settlers Queen, Mary Galer. Okay, nobody do the math, but this was one of my proudest moments of my high school career. I loved the chance to represent my hometown community, and wearing the crown, well, that was just a bonus. Queens are sort of a rite of passage in this area. 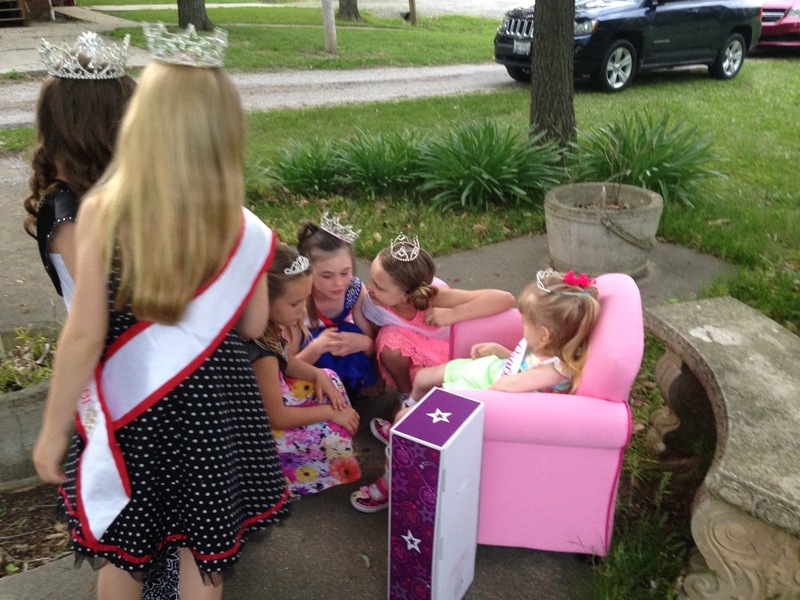 All of our communities throughout the county have pageants as part of their summer celebrations, each with young girls and teens, dreaming of the chance to be a real-life princess. Meet the Queens on a Mission! Kyle asked me once what I would do if Grace told us she wanted to be in a Little Miss pageant. I told him that I would not push her to do something like that, but that if she came to us, and wanted to, I was for letting her try it. I told him that there are lots of really great lessons to learn from pageants, like always doing your best, speaking or singing in front of a crowd and even that not everyone wins all the time. 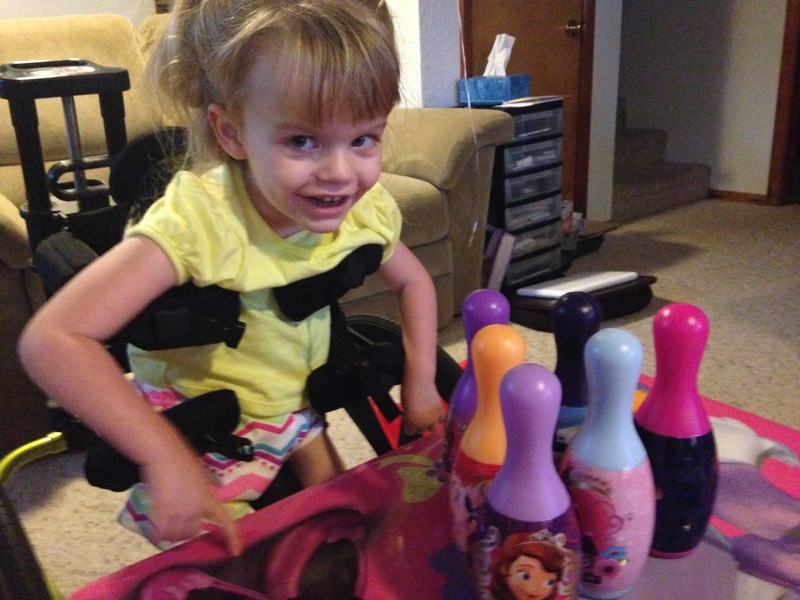 Since being diagnosed with INAD, we know Grace may not have that chance. However, she has been adopted by a sweet group of five queens, helping to raise money for the research study. Meet Reagan, Lauryn, Addi, Kearstynn and Summer, five girls with the biggest hearts. They are truly "Queens on a Mission!" 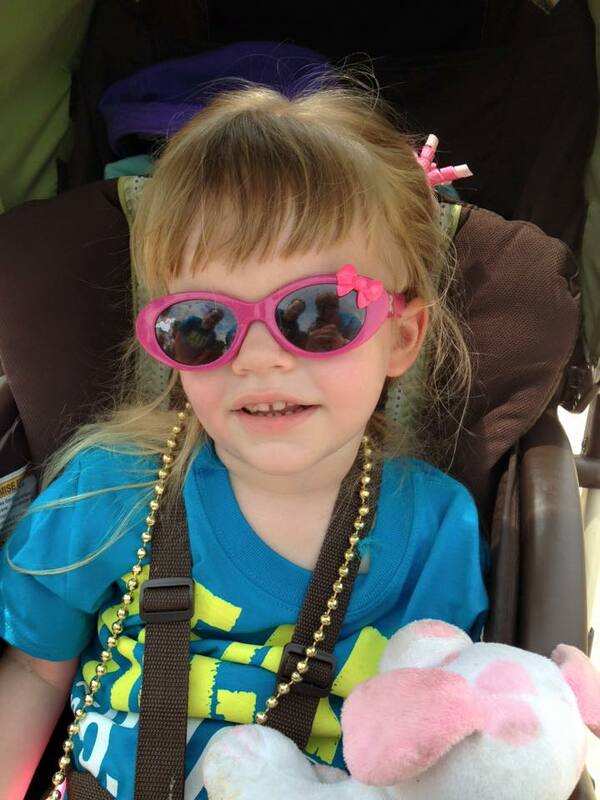 Earlier this spring, Addison's mom gave me a call to say she had an idea for a fundraiser. 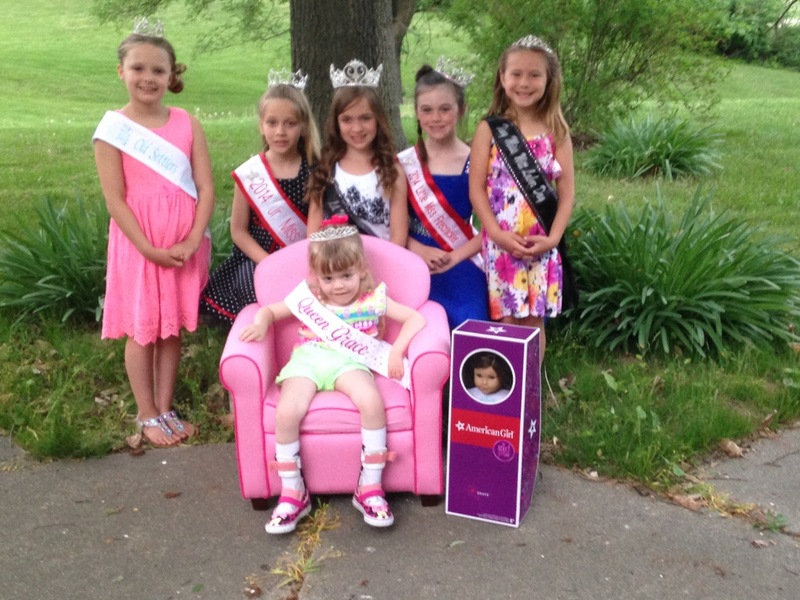 This year's American Girl doll was named, Grace, and they wanted to raffle one off to raise money for the INAD study. We were thrilled! Grace just LOVED when the girls were talking to her. They ended up getting the doll, as well as a set of St. Louis Cardinals tickets and some gift cards to raffle off as part of the fundraiser. Before they started selling tickets, they asked me if I could bring Grace to be in the photo with the girls. And they wanted her to wear her Queen Grace crown and sash from the father-daughter dance in Litchfield in April. The girls were so cute in all their royal accessories, and Grace certainly loved all the attention when the girls were talking to her. The picture ran in the paper announcing the raffle was starting, but the girls wanted to do more. The past two weeks, they have been at Dollar General and IGA, and plan to be at the Hillsboro Sports Complex this coming weekend. Tickets will be sold until July 4, when Grace will get to draw for the prizes. So, if your'e looking for a great way to join "A Grace-Filled Journey," help these special "Queens on a Mission." They are true royalty, inside and out.